Once upon a time, there was this lonely grape called Petite Sirah. Upon discovery, farmers and winemakers loved this grape so much that they nicknamed it “petet serre” and said it very fast with a grin. The real name of the varietal is Durif (named after a French scientist who crossed Syrah and Peloursin at the end of the nineteenth century). For years, this varietal sat lonesomely on the shelves gathering dust. Customers breezed by it, reaching for Cabernet Sauvignon, Pinot Noir, Zinfandel and other more famous varietals. It is my intention to bring this varietal to the fore. Not as ferocious as most Zinfandel, less stately than many Cabernet and much more robust than elegant Pinot Noir, Petite Sirah has found its home among people who simply enjoy wine and food without pretense. I often call upon it for parties and when the gang comes by on the weekend for outdoor grilling and potluck meals. In today’s lesson, I have chosen three Petite Sirah for your enjoyment. 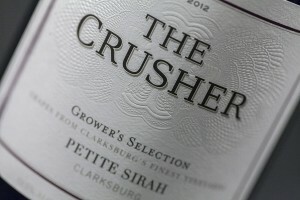 The 2012 The Crusher shows a shading of wood and plenty of pleasing grapiness. Coats the palate well and invites a plate of polish sausages, hot links and plain ‘ole hot dogs. For a fruiter style, with a bit less wood, I would go for the 2012 HandCraft. Perfectly poised, with its pretty red fruit flavors that pair nicely with roast chicken, I can almost feel the match on my palate. In the lighter and more elegant style, the easy-drinking 2012 Bogle does the trick nicely. Not just for meals, Petite Sirah can serve as a cocktail wine to be paired with hors d’oeuvres. So take a trek off of the beaten path, snag one of these Petite Sirahs, and educate your palate about one of California’s hottest under-the-radar varietals. For more information, check out the group: P.S. I Love You, here is a link to their website. I think I’ll grab a bottle of Petite Sirah to enjoy with a savory pot roast for a comforting dinner on a foggy summer day in the city by the bay.